In addition to outstanding technical excellence , the Rockdoor Stable Door looks good too , property owners can choose from a wide range of colours including white , mahogany , rosewood , golden oak black , blue , green , red , grey both externally and internally . For well over a decade now , Rockdoor has been manufacturing the ultimate high performance Stable Door and it is now fully CE marked. It is the closest thing to an original Stable Door . While it remains true to the traditional style, it has all the benefits modern door technology can offer for your home. 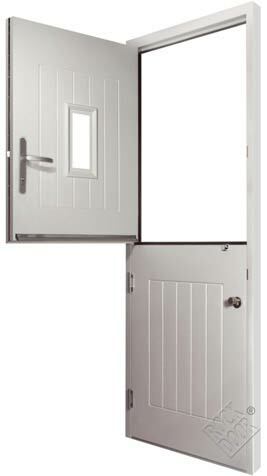 With fully adjustable hinges the stable door can be adjusted horizontally and vertically so it opens and closes perfectly every time. It also has a bespoke central seal so there are no draughts or leaks. And because it's manufactured to Rockdoor's high performance specifications, it offers security, durability and low maintenance as standard as well as being backed by a 10 year rock solid guarantee . Our Rock door Stable Door is available with three sizes of glass in the top half of the door - Spy View , View Light and the new diamond, as well as a solid version with no glass. The realistic wood grain surface makes it look and feel as stylish as a traditional wood door, with high "kerb appeal" unlike a upvc panel door. It's ultra robust, resists scratching and is easy to keep clean. A multi point locking system engages into solid stainless steel which runs the whole length of the frame. Your Rockdoor cannot be forcibly levered open and anti-drill plates prevent locks being drilled for high security. Plus the external frame is as strong as the door itself.Rockdoor exterior doors are so such strong and secure doors that even the police couldn't break in! Rockdoors are designed to be one of the most secure doors on the market. Achieving PAS 23 & 24 and equal to secure by design ensuring you have high security doors , Rock door ensures that your safety and high security are our number 1 priority . Our stable door gives a unique blend of high security and performance - allowing you to open the top only keeping young children and pets secure whilst permitting fresh air into the house.